Every year on Jeff's birthday (I think some of you refer to this day as "Christmas"), I make him whatever cake he wants. For a few years, it was always cheesecake, but a couple years ago I made him a Key Lime cake. This year, he requested that cake again. This cake, although called a key lime cake, doesn't actually call for any key limes, using regular limes instead. So, being somewhat of a lime purist (but who isn't? ), I decided to step it up a notch and use real key limes. This turned out to be a Very Bad Idea. In case you aren't familiar with key limes, they are much smaller than their standard equivalent. They are little spheres, walnut-sized or smaller. They are perfect for, say, garnishing a margarita, but, as it turns out, not ideal for my purposes today. 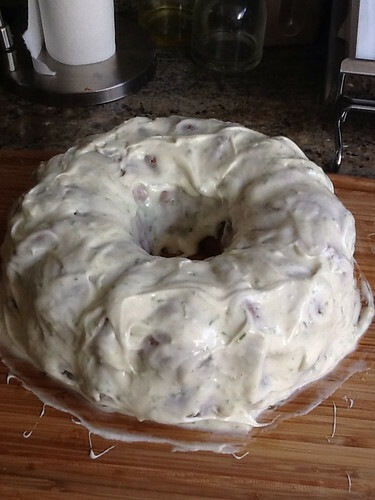 This particular cake has a lime-sugar syrup that you pour on the cake. This step calls for a half cup of lime juice, which I was planning to squeeze by hand, requiring me to slice each lime in half. And, being that these little balls of joy are round, they roll. So, yes, I also sliced my finger. It wasn't stitches-worthy, but had to be dealt with, and of course happened when Jeff was in the shower, and Jelly was "helping" me, which at that moment consisted of making handprints in the flour on the counter. She refused to leave the kitchen, so I had to carry her out with my non-bleeding hand, while still maintaining constant pressure on my finger, and holding it above my heart for good measure. Bandage applied, I looked forward to the opportunity to get a lot of citrus juice in the cut, and returned to slicing the little green balls. When I thought I had enough limes, I started juicing what I now refer to as Satan's testicles. I quickly learned that each little green nugget of joy gives out about one teaspoon of juice. I needed half a cup. I asked Siri and she told me that there are TWENTY FOUR teaspoons in a half cup. After juicing about twelve limes, I couldn't take it any more, and went out to pick a few regular limes off our tree and finish the job. Hey, at least I didn't resort to juice from a bottle. Limes juiced, syrup made, and cake in the oven, I embarked on the cream cheese frosting: cream cheese, margarine, powdered sugar, and one third of a cup of lime zest. Wait, what? How the hell am I supposed to zest these little f-ing limes, especially now that half of them are already juiced and squashed? Do you know how many key limes it takes to get a third of a cup of zest? Neither do I.
I did my best, got as much zest as I could, which turned out to be plenty because this recipe makes about a gallon of frosting, about a third of which I used. Also, it does not take a genius to predict that I zested my knuckle. In the end, the cake was delicious. And now I have a bag of unused key limes. Margaritas, anyone? One time we lost the remote. I'm not talking about the slipped behind the couch cushions kind of lost, this thing was gone. At least until I remembered that Moe had been playing with the remote, and that I had taken a bag of clothes I had been sorting back to Moe's room. Sure enough, the remote was in the bag in Moe's closet. This phenomenon of household items finding their way around the house is called "domestic drift." In our house, this is more like Household Hurricane, specifically Hurricane Moe, who has a tendency to run into a room, pick up a toy (or more likely some small piece of a toy) and run away with it. Usually, he drops it somewhere where it is easily spotted, but sometimes things become well and truly lost. This drives me crazy. I cannot stand things like missing puzzle pieces, and always try to make sure I have every piece before cleaning up a toy. But inevitably, something will be missing. The best thing to do is generally just wait and the piece will turn up eventually. But sometimes you get a brand new toy that has three penguins and then one day later you only have two penguins and you really just want to find the blue penguin because you know it is somewhere in the house and most of the doors have been closed all day so where the f*@# could it be? 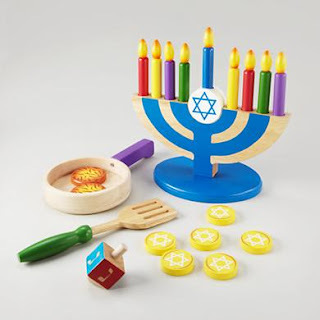 And other times, you bring out the cool Hanukkah toys, which had all of their pieces, but in two days have lost two candles and one flame. It will be a miracle if I still have all these pieces after 8 days. I just spent the last 15 minutes looking for above items. As I looked, I found a remarkable number of bits and pieces of things hidden in various bins and buckets, so I spent the time just walking back and forth from room to room replacing things as I went. Pieces of toy food went back to the play kitchen, magnets in Moe's room, train tracks in Jelly's, Legos back to Moe's room, etc. It was remarkably satisfying. Update: I have located the penguin! 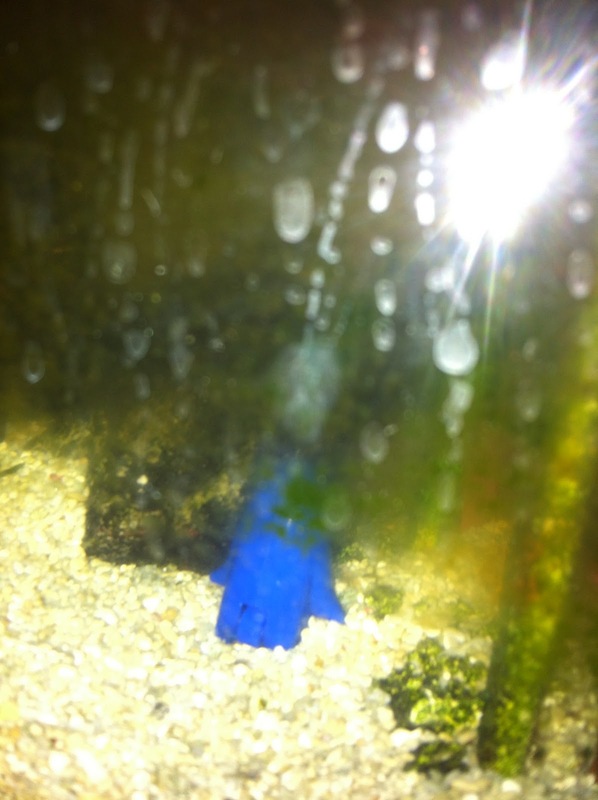 It was in the fish tank. I am not making this up. The One in One Hundred. We are not rich, and we are not privileged. Not in a way the 99% understand, anyway. We are the families of children with autism. Most of the time, you may not notice us. Our kids' disabilities are often invisible. They look just like any other kid. Maybe even a little like your kid. But you might not notice us for other reasons too. You might not see us at the park, because we are afraid that our children will run away, that even one second of distraction could end in tragedy. You might not see us at a restaurant, because our kids might not be able to sit still for a whole meal or eat very few things. You might not see us at play dates because our kids don't know how to interact appropriately with other kids, or may get overwhelmed at new places. You might not see us at school because we're on the other side, in the special education pick up line. You might not see us at the grocery store because our kids can be overwhelmed by all the lights and sounds, or don't understand how to stay close to us even though they are too big to fit in the cart. You might not see us at the mall because it is hard to change the diaper of a four year old in a public restroom. You might not see us with our spouses at nice restaurants or movie theaters because it is hard to find a babysitter we trust to keep our kids safe. If you do notice us, it is probably because our kids are doing something you don't understand. He might be giggling for no apparent reason, or bouncing in his chair. She might be flapping her arms or having a temper tantrum. He may not look at you when he speaks. She may not speak at all. And sometimes we are so tired, because our kids often have trouble sleeping, or we lie awake at night worrying about their futures, that we don't have the energy to go anywhere. Sometimes the one percent recognize each other when we are out, but despite our rising numbers we are still few and far between. We love our kids, just like the 99% do. We are proud of them, and believe in them. We fight for their right to have a safe, accepting place in this world. 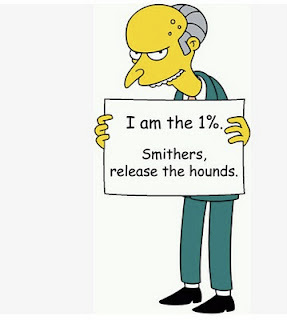 But the world is a scary place for us one percent. And so often we stay at home and surround ourselves with what we need to get by. The right foods. The right toys (even if they aren't "age-appropriate"). A fenced-in backyard. Extra locks on the door. A long twitter feed where we can connect with the rest of the one percent. And connect we do. So though it may be easy for the 99% to forget we are here, just try crossing one of us. Or telling us our kids can't do something. Or denying them an education. Or respect. Try it and you will hear the voices of the one percent come together from around the world. We are loud and unafraid. We stand by each other. We help each other by telling our stories and sharing in the joy and sorrows. Update: The latest statistics show autism rates at closer to 1 in 88, higher for boys. I don't actually know the number of families with autistic children, so the numbers are probably a little different. Approximately one in one hundred and ten children are diagnosed with autism, but many families have more than one child diagnosed. So I'm approximating. And of course, there are many other types of special needs families who experience some of the same challenges and isolation. Also, the above are just examples. Every child with autism is different, and I'm not intending to represent everyone. Today I'm over at Hopeful Parents, where I contribute on the 14th of every month. Come over and read about how writing a novel has made it so much harder to keep on blogging! And if you feel so inclined, please leave a comment over there! Jeff took a week off while he was in between jobs. Then he started his new job, which is right down the street and around the corner from Moe's school. No more commute! It helped make taking our house off the market for a while feel like the right thing. The kids were healthy and, for the most part, sleeping well. The massive schedule upheaval after the time change had finally worn off. There were some ups and downs with the extra days off during the month but things were pretty stable. The month ended with a visit from my parents and a pretty successful Thanksgiving holiday. Oh how I miss November. Moe and Jelly both got colds and have had trouble sleeping. Moe is stuffed up and his sensory needs have gone through the roof. Starting at school on Friday and continuing through the weekend, he has been grabbing, biting and pulling with very little warning. Our dog Berkeley has gotten the brunt of it. In fact, Moe has decided that it is so rewarding to pull on the dog and grab her fur, her tail, or her paws, that he has been actively going after her. Moe has hurt Berkeley several times, and she can't figure out to just stay away from him. Maybe we need to add doggie Stockholm syndrome to her long list of issues. This afternoon got so bad that after Moe's bath (which was supposed to help him fulfill some of his sensory needs but ended up riling him up more), Jeff couldn't even get Moe's clothes back on him. Moe was laughing, kicking, and pulling. He was physically unable to keep still. And he's laughing the whole time, which we understand is also not in his control, but makes it quite frustrating for us. Jeff put Moe in his bed and closed the bed tent to help him calm down. When we went to check on him a few minutes later, he had taken off his pull-up and peed all over the bed. I know Moe can't be happy like this, although he doesn't seem too upset about it. He was manic and out of control and it scares me. Berkeley has been tolerant, but she is a dog and could bite (though she never has). And what if he hurts Jelly? Moe is only four, and so I always have to go down the "how will I handle this when he's bigger?" path until Jeff yanks me back and reminds me to take it one day at a time. Which I find absolutely impossible to do. With Moe, behaviors tend to come and go and we rarely understand why. And poor little Jelly has to witness all of this stress and yelling and frustration. She takes it in stride, but she notices. Today I saw her push the dog out of the way, and although she got an immediate time-out, I felt awfully hypocritical because I'm sure I pushed the dog out of the way a hundred times today. This is the worst I've seen Moe in a long time, and it has lasted longer than I remember something like this lasting before. We gave him melatonin tonight and he fell asleep quickly. I hope that he sleeps through and that a good night's sleep will help him regulate tomorrow. I hope he doesn't hurt anyone at school tomorrow. I hope that December improves. At 38 years old, I still don't feel like I've found my "calling" and I wanted to see if writing could be it. I've always wanted to write a novel and it was time to try it. Now that I've completed it, I've been thinking about what is next. First, the book is in no way ready to publish or even consider giving it to anyone in publishing, in a publishing-related field, or who might walk close by an office building that houses a publisher. Although the book is a complete story, it probably requires about another 50,000 words to add things like character back stories and secondary story arcs. So right now, I need to decide if this is a story I want to work with. If so, there is a lot of work to do. That work includes editing the many extraneous words I used, because during NaNoWriMo, if something can be said in two words that you said in four, you should probably try to add a few more words. If not, the first little bits of other stories are starting to percolate in my head. I've signed up for a fiction writing class to stay motivated. The class focuses on short stories and chapter writing, and may be a good way to re-write some of my current novel or help shape some ideas for another one. I haven't taken a creative writing class since high school English! You do not need to try to figure out how long ago that was. This post inspired by the prompt "What's Next?" at Kick in the Blog.